Happy Mother's Day Week, Mamas! We hope you all have a fantastic week! Our "gift" to your this week is AMAZING giveaways that we think you will love and we are starting this week with a BANG!!! How would you like to win a ring valued at $99.95!!!???!!! We love this ring from Blue Steel! It is called Enchantment, and I knew I had to review it because it has 3 stones, one for each of my children! The metal is from surgical grade stainless steel. The stainless steel allows it to hold up to many conditions, and it is comfortable to wear. 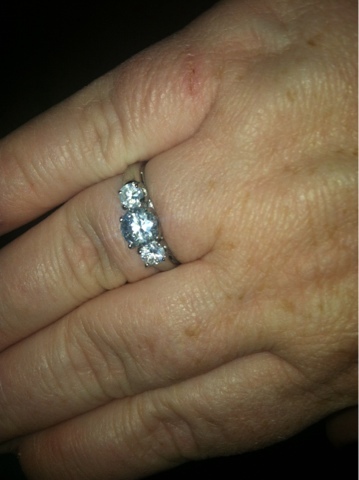 Of course, it is a stunning ring in person, and I get compliments all the time! It comes in this beautiful gift box, perfect for mom! MamaBreak received a ring from Blue Steel to review here on MamaBreak. We did not receive any other type of compensation. As always, our experiences and opinions are our own. I would keep it for myself, love it! I love this ring and would keep it for myself. It would be a wonderful gift for my Mother. She deserves it, for all her unconditional love and sacrifice. I think I would have to give this one to my Mom. She would absolutely adore it! I wold have to give this to my mom. I would love to keep it! I don't have much jewelry due to the fact that me and my hubby of sixteen yrs for the last ten since he was 29 he has suffered from Parkinson's disease and we have four boys ages 11 whom is Autistic high functioning that is our 14 yr old is ADHD lots of energy but he is on the honor roll with a 3.9 G.P.A. which rocks so much! and two freshman ages 15, and 16 so I am a full time caregiver for everyone in here 365 days a yr due to no Fam. in AZ. we are both originally from Chicago so yes my mom comes but every couple months. Plus because of all the disabilities we live on SSI and SSA and I can't leave to work so I take care of everyone everyday do all the running and cleaning and cooking and shopping so it is a challenge some days I don't feel like doing anything sometimes so if I won that ring it would b an extra special Mother's day for me! I never get anything expensive like that hell I am still waiting to have a wedding cause we went in front of a judge. And I never ever had a honeymoon or even a wedding band I had one yrs ago and found out we were taken they said it was real and it broke about a yr later and that was the last one I ever had so I could use it on my marriage finger that would b awesome to look down and see it on my finger. But good luck to all and god bless no matter whom wins! I will probably give it to my daughter. She is so pretty and the ring would look good on her. I would give this ring to my beautiful wife.